Is all this possible? I'm having my doubts. Serious doubts. I thought I'd be able to fit in a little work in the evening after the kids went to bed, but the boy and baby girl have decided that they don't want to sleep. They'd rather wear us down until we can go no more, then all crash in a heap on mom & dad's bed. Matt said that he'd take the kids away for a few hours on Saturday, which will help, but I have a feeling I'm going to be cutting some projects from my list. Ill probably be making the mad mall dash next weekend to fill in the gaps. Hello, Master Card! 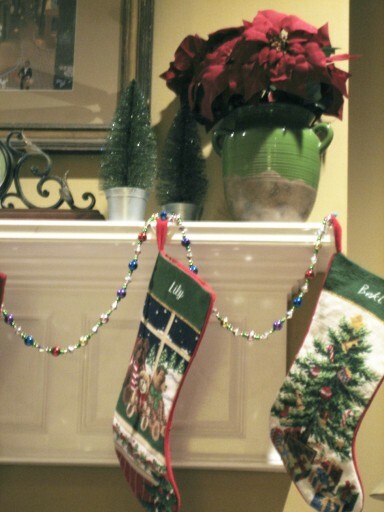 This is a corner of my mantle decorated for Christmas. It's fairly simple, but I like it. I like the sparkle of the shiny beads, the colors in the stockings, the glitter on the trees, and the contrast of red & green between the olive jar and poinsettias. I'm going to be a little sad when it's time to put all of this away. Here is a corner in the girls room. I really do love this room. I think I like it so much because it is the room I never had growing up. Hmm, I guess I always have had a thing for decorating and creating my own space. Anyway, the think I want to talk about is what's IN this corner. 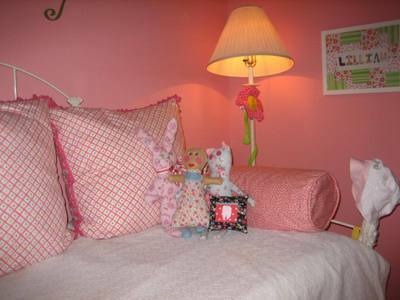 See that little black and pink pillow there? It's a tooth fairy pillow. 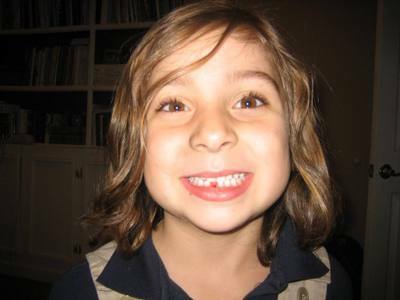 Yep, the Tooth Fairy will be visiting our house for the first time very soon. Lily is driving me crazy with that darned loose tooth. I can only stick my finger in her mouth to feel her loose tooth so many times. I think it's pretty gross, actually. I whipped this pillow up last night while the kidlets were in the tub. It was a collaborative effort between Lily and I. I had in mind how the pillow should look, she picked out all the fabrics. 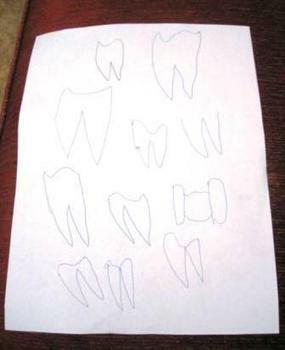 She also drew me an assortment of teeth to choose for the applique. 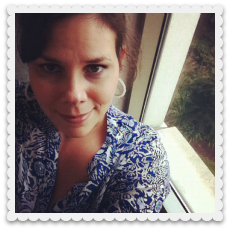 I then sewed it up. I think we did a pretty good job! In case you didn't know, that little pink patch on the front is actually a pocket, a place to put the tooth so that the Tooth Fairy can find it easier. It's also a nice place for the Tooth Fairy to put the moolah! 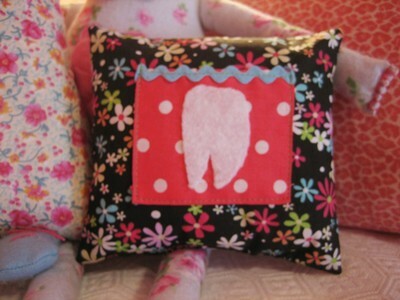 I'm glad I got that pillow done in time as I just got news that the tooth is hanging by a thread. Yuck! It's been ages since I've done one of these, but here it is, a corner of my home. A real corner, reflective of our living. This is one of the first pieces of furniture we bought when we got married. We bought it unfinished, stained it ourselves. I don't know what I was thinking staining it that dark, but now it matches the hand-me-down table and chairs from my grandma. It was intended to display our wedding china because at the time we were living in an old bungalow in Baton Rouge's Garden District that had no storage space at all. Today I display my colorful pottery and my chickens. Much happier (and prettier) than my boring old china. Yes, that's my sewing paraphernalia on the top shelf. 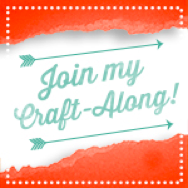 Even though I have a sewing room studio, I prefer to sew at my kitchen counter, in the hub of activity. I have to keep the non-kid friendly stuff up there, out of the reach of little hands. 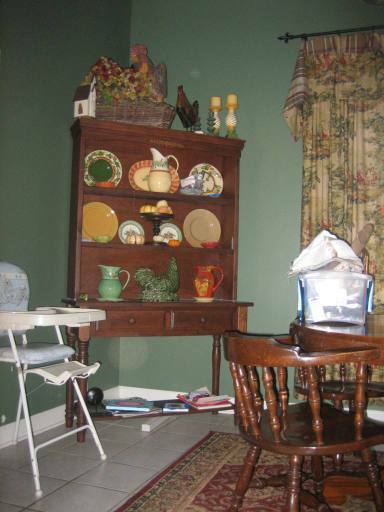 Those pumpkins used to be on the table, but they kept flying across the room so they needed to be put out of reach. And that bottom shelf, that's reserved for whatever needs to be put away at the moment. Sometimes it holds my sewing machine, or the flower arrangement from the center of my table, or a box holding my current sewing projects (seen on the table right now). It's multipurpose. Today it's holding the canvases Lily and I worked on last night. That's also a great hiding space for little people, just as long as they don't bump too much. I like this corner, it makes me happy. This corner and I are well acquainted these days. It isn't decorated and doesn't look all that great, but it does my achy pregnant body good. It doesn't matter if I've showered earlier in the day or not, I soak in this tub every evening no matter what. This house of ours has quite a few oddities, but this tub is a positive along with the huge hot water heater. I can fill this baby up with hot water without a problem while running the dishwasher. 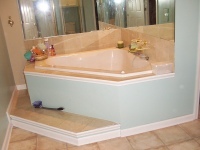 The only part I don't like about this tub is the mirrors (which are in dire need of a cleaning). It isn't too pleasant seeing my big ole pregnant body swing a leg over the side of the tub to climb in or out, which is getting difficult to do. I'm afraid I may take a spill one day soon, but I'm not giving up my tub! I know that once the baby comes it will be quick showers for a while, so I am trying to enjoy my soaks as much as possible right now. Check out other corners here.